The origins of the name "Wheeling" are disputed. One of the more credible explanations is that the word comes from the Lenni-Lenape phrase wih link or wee lunk, which meant "place of the head" or "place of the skull." This name supposedly referred to a white settler who was scalped and decapitated. His severed head was displayed at the confluence of Wheeling Creek and the Ohio River. Native Americans had inhabited the area for thousands of years. 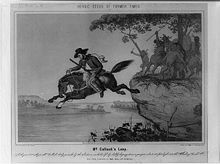 In the 17th century, the Iroquois from present-day New York state conquered the upper Ohio Valley, pushing out other tribes and maintaining the area as their hunting ground. Originally explored by the French, Wheeling still has a lead plate remnant that the explorer Céloron de Blainville buried in 1749 at the mouth of Wheeling Creek to mark his claim. Later, Christopher Gist and George Washington surveyed the land in 1751 and 1770, respectively. During the fall of 1769, Ebenezer Zane explored the Wheeling area and established claim to the land via "tomahawk rights." (This process meant to girdle a few trees near the head of a spring, and mark the bark with the initials of the name of the person who made the claim). He returned the following spring with his wife Elizabeth and his younger brothers, Jonathan and Silas; they established the first permanent European settlement in the Wheeling area, naming it Zanesburg. Other families joined the settlement, including the Shepherds (see Monument Place), the Wetzels, and the McCollochs (see McColloch's Leap). Local men defended the fort, later joined by recruits from Fort Shepherd (in Elm Grove) and Fort Holliday. The native force burned the surrounding cabins and destroyed livestock. Much of this area had been settled by yeomen farmers, few of whom owned slaves. With the railroad, a larger industrial or mercantile middle-class developed that depended on free labor; it either felt disinterest or hostility to slavery. The Wheeling Intelligencer newspaper expressed the area's anti-secession sentiment as tensions rose over slavery and national issues. The city became part of the movement of western areas to secede from Virginia after the beginning of the Civil War. It was the location of the Wheeling Convention. 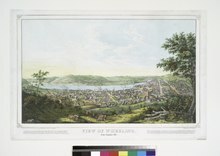 It served as the provisional capital of the Restored Government of Virginia from 1861 to 1863, and became the first capital of West Virginia after it seceded from Virginia and was admitted to the Union in its own right in 1863. Although Wheeling lost its position as state capital in 1865, it continued to grow. In the late nineteenth century, Wheeling was the new state's prime industrial center. One early nickname (until an 1885 strike) was "Nail City", reflecting the iron manufacture in several mills which dated from the 1840s. Mills transformed pig iron into sheets which could be cut, and some mills also produced boiler plates, stoves, barrel rings and/or ornamental ironwork. Noted businesses of the era included the Bloch Brothers Tobacco Company (owned by state Senator Jesse A. Bloch who would in 1913 introduce legislation which became the state's Workmen's Compensation Act), and later steel concerns after development of the Bessemer process. Wheeling Steel Corporation was created in 1920 and grew after a 1927 strike caused J.P. Morgan and other investors to sell National Tube Company, which had been created in 1899, six years after local owners had consolidated five plants in the area as Wheeling Steel & Iron Company. Wheeling also had considerable associations with the American labor movement. In 1904 it became the first city in the country to refuse a proposed Andrew Carnegie gift of a free library, because of the industrialist's labor record, especially the notorious Homestead Strike of 1892. By contrast, cigar tycoon Augustus Pollack (despite once rousing controversy by a plan to use convict labor) left many bequests to the labor movement, which erected a memorial statue. The city's earliest union was the United Nailers (1860, which later merged into the Amalgamated Association of Iron and Steel Workers), followed by the cigar makers in 1862. The 1877 railroad strike at Martinsburg, West Virginia reached Wheeling and became nationwide. In 1897, Eugene Debs, Mother Jones and Samuel Gompers were among the speakers at a national labor convention in Wheeling to discuss a nationwide coal strike. As the city grew, prosperous Wheeling residents built fine houses, especially on Wheeling Island, but slums also expanded. As a result of that growth, an ordinance was passed regulating personal cesspools, including a ban on pipe communications with other homes and businesses unless offensive smells were properly trapped. With industry, Wheeling reached its peak of population in 1930. The Great Depression, and later changes and restructuring in heavy industry following World War II, led to a loss of working-class jobs and population. Capitalizing on its rich architectural heritage, Wheeling has worked to revive its main street, as well as promote heritage tourism near the Ohio River. West Virginia has also invested in fiber optics networks for advanced communication. Wheeling is becoming a center in health services and education as well. Wheeling is located at 40°4′13″N 80°41′55″W﻿ / ﻿40.07028°N 80.69861°W﻿ / 40.07028; -80.69861 (40.070348, -80.698604). The city has a total area of 16.01 square miles (41.47 km2), of which 13.79 square miles (35.72 km2) is land and 2.22 square miles (5.75 km2) is water. Wheeling lies on the transitional climate zone between the humid subtropical climate and the humid continental climate (Köppen: Cfa/Dfa, respectively) with hot humid summers and cold winters. The annual precipitation is about 37 inches. As of the census of 2010, there were 28,486 people, 12,816 households, and 6,949 families residing in the city. The population density was 2,065.7 inhabitants per square mile (797.6/km2). There were 14,661 housing units at an average density of 1,063.2 per square mile (410.5/km2). The racial makeup of the city was 91.2% White, 5.1% African American, 0.2% Native American, 0.9% Asian, 0.2% from other races, and 2.4% from two or more races. Hispanic or Latino people of any race were 0.9% of the population. As of the census of 2000, 31,419 people, 13,719 households, and 7,806 families resided in the city. The population density was 2,258.4 people per square mile (872.1/km²). 15,706 housing units were present at an average density of 1,128.9 per square mile (436.0/km²). The racial makeup of the city was 92.72% White, 4.99% African American, 0.10% Native American, 0.91% Asian, 0.03% Pacific Islander, 0.16% from other races, and 1.09% from two or more races. Hispanic or Latino people of any race were 0.58% of the population. Of the 13,719 households, 23.4% had children under the age of 18 in them, 41.8% were married couples living together, 12.2% had a female householder with no husband present, and 43.1% were non-families. 38.3% of all households were made up of individuals and 18.6% had someone living alone who was at least 65 years of age. The average household size was 2.17 and the average family size was 2.89. In the city the population was spread out with 20.6% under the age of 18, 9.1% from 18 to 24, 24.3% from 25 to 44, 24.5% from 45 to 64, and 21.6% who were at least 65 years old. The median age was 42 years. For every 100 females 84.1 males were present, and for every 100 females age 18 and over, were 79.6 males. The median income for a household in the city was $27,388, and the median income for a family was $38,708. Males had a median income of $30,750 versus $22,099 for females. The per capita income for the city was $17,923. About 13.1% of families and 18.0% of the population were below the poverty line, including 23.3% of those under age 18 and 11.2% of those at least 65 years old. Under West Virginia law, cities may adopt the Manager-Mayor Plan. The elected mayor presides over meetings of the Wheeling City Council, which has six members elected from geographic wards. City Council members serve four-year terms. The City Council also confirms executive nominations for members to various boards which have limited regulatory authority, including the Planning Commission, the Board of Zoning Appeals, and the Traffic Commission. The City Manager serves as Chief Executive and Administrative officer for the city. The current Mayor of Wheeling is Glenn Elliott, and the current City Manager of Wheeling is Robert Herron. The current members of City Council are Vice-Mayor Chad Thalman (1st Ward), Ken Imer (2nd Ward), Melinda Koslik (3rd Ward), Wendy Scatterday (4th Ward), Ty Thorngate (5th Ward), and Dave Palmer (6th Ward). City elections were held on May 10, 2016, and the current term began on July 1, 2016. City elections will be held again on May 12, 2020. The city of Wheeling has a rich and varied history. West Virginia Independence Hall was the site of the Wheeling Convention, two meetings held in 1861 that ultimately reversed Virginia's Ordinance of Secession. Twenty-six counties in Virginia's north and west voted against secession from the Union and created the new state of West Virginia, which the United States quickly admitted. Later in 1861 and continuing to 1863, the building was the site of many heated debates during the First Constitutional Convention of West Virginia including the name of the new state. The oldest building in the area is Shepherd Hall (Monument Place), built in 1798. The first official memorial monument in the state of West Virginia, dedicated specifically to men killed in the Vietnam War, was dedicated in Wheeling, with full military honors, in a Memorial Day 1986 ceremony. The monument was erected in front of the flagpole near the main shelter of Bethlehem Community Park in the village of Bethlehem, just southeast of Wheeling. The roughly 6-foot-high granite memorial consists of a large, bronze dedication plaque with the names of KIAs from the Wheeling/Ohio County region. Below the dedication plaque is a bronze map of South Vietnam, complete with names of 28 major cities. Wheeling has a long tradition of live musical performance and radio broadcasting. With over 2,500 seats, The Capitol Theatre is the largest theatre in West Virginia. Opened in 1928, The Capitol was home to It's Wheeling Steel, a popular radio program in the early '40s featuring musical performances by workers at a local steel plant. The Capitol has welcomed musical performances of all types, from Johnny Cash, Merle Haggard, and Tammy Wynette, to Ray Charles, Bob Dylan, B.B. King and Black Sabbath. Other past performers include Jerry Seinfeld, David Copperfield, and George Carlin. Wheeling is also home to the Victoria Theater, the oldest theater in West Virginia. The 700-seat Victorian-style theater was home to the WWVA Jamboree program from 1933–1936. More recently, it has been the site for the "Wheeling Jamboree", a local initiative started in 2009 and modeled after the original WWVA Jamboree (which changed its name in the 1960s to Jamboree U.S.A.). The original WWVA Jamboree ran from 1933–2007, making it the second longest running country radio program and a variety show in the country after the "Grand Ole Opry" in Nashville, Tennessee. Live music emanates from the amphitheatre at the Wheeling Heritage Port several nights per week from mid-Spring through late-Fall. The waterfront park area hosts numerous festivals, concerts, movie nights, celebrations, a regatta and numerous visits from the Delta, Mississippi and American Queen riverboats. The Port holds over 8,000 spectators and has become a city focal point. Fans of theater have several options in Wheeling. The Capitol Theatre hosts numerous touring musical performances. In addition, the Oglebay Institute's Towngate Theatre in Center Wheeling has, for over 35 years, produced plays. Wheeling, known as Nail City, is home to the Wheeling Nailers hockey team. The Nailers play in the WesBanco Arena (formerly the Wheeling Civic Center), and are part of the Central division of the Western Conference of the ECHL. High school football and soccer are played at Wheeling Island Stadium. Formerly home to the Ohio Valley Greyhounds, Wheeling became home to a second team in 2009. The team, known as the Wheeling Wildcats, played in the Continental Indoor Football League but folded after the 2009 season. Wheeling is also home to the headquarters of the Mountain East Conference, a NCAA Division II conference that launched in the 2013–14 school year. Wheeling Jesuit and West Liberty are both charter members of the new conference, an offshoot of the disbanding West Virginia Intercollegiate Athletic Conference. In accordance with House Bill 271, adopted on March 8, 2007, Ohio County and Jefferson County held special elections on June 9, 2007, to approve the legalization of table games within the respective counties. The Ohio County measure passed, but the Jefferson County one failed. A similar measure was successfully adopted in Hancock County on June 30, 2007. 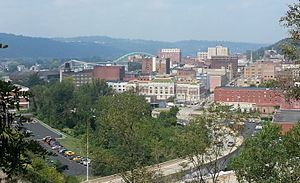 Due to its proximity to Pittsburgh, Wheeling is heavily influenced by that city's broadcast media outlets, which are easily received in the area. Besides broadcast stations Wheeling's cable providers carry AT&T SportsNet Pittsburgh and the Pittsburgh-centric news/talk channel PCNC as its "home" sports and information sources. In addition to the Pittsburgh outlets, the Wheeling television market is served by ABC/CBS affiliate WTRF-TV Channel 7, PBS affiliate W30CO-D Channel 30, and NBC/FOX affiliate WTOV-TV Channel 9 in nearby Steubenville, Ohio. Cable television provider Comcast serves the city, parts of which Centre TV also services. Wheeling is home to WWVA 1170 AM, the state's only 50,000-watt AM station that can be heard throughout the East Coast at night. WVLY 1370 AM and WKKX 1600 AM provide local news, sports, and talk. On the FM dial, WVKF 95.7, WKWK 97.3, WOVK 98.7 and WEGW 107.5 provide the area with various music genres. The Wheeling area is the home of WDUQ-LP, a listener-supported commercial-free station, which also serves as the local Pacifica affiliate. Pittsburgh's radio stations provide Wheeling with coverage. Several translators and repeater stations provide NPR and American Family Radio networks. Wheeling also has a student-run radio station, WPHP 91.9, that Wheeling Park High School students operate. WPHP plays top 40 songs and also covers all of the Wheeling Park Patriots' football and basketball games. The city is home to The Intelligencer and Wheeling News-Register newspapers, which Ogden Newspapers Inc., based in Wheeling, owns. The Intelligencer is published weekday mornings and Saturdays, while the News-Register is published weekday afternoons and Sundays. The Times-Leader of Martins Ferry, Ohio, another Ogden Newspapers Inc. paper, also covers Wheeling issues. In Wheeling magazine is published quarterly and covers society and events in the city. Two local websites, Weelunk and Dateline: Wheeling, serve as independent news sources for the city. The Fort Henry Bridge carries I-70, US 40, and US 250 across the Ohio River in Wheeling. The Fort Henry Bridge and Vietnam Veterans Memorial Bridge carry I-70 and I-470 respectively over the Ohio River. 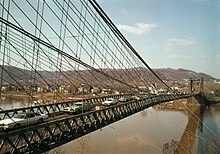 The historic Wheeling Suspension Bridge, completed in 1849, which was part of National Road, now carries cars and light trucks as well as pedestrian traffic between downtown and Wheeling Island. I-70 passes under Wheeling Hill through the Wheeling Tunnel. The East Ohio and Ohio Valley Regional Transit Authorities, which share the Intermodal Transportation Center as the hub for Hub-and-Spoke routes, provide regional transportation through West Virginia and Eastern Ohio. Wheeling operated streetcars from the 1880s until 1943 under the Wheeling Traction Company and Co-operative Transit Company. Buses replaced streetcar operations due to operating costs. ^ a b "American FactFinder". United States Census Bureau. Archived from the original on 2012-02-17. Retrieved 2013-01-24. ^ Sullivan, Ken, ed. (2006) . The West Virginia Encyclopedia. West Virginia Humanities Council. ISBN 0-9778498-0-5. ^ a b Cranmer, Hon. Gibson Lamb., ed. (1902) . History of Wheeling City and Ohio County, West Virginia and Representative Citizens. Chicago: Biographical Publishing Company. ^ Ronald L. Lewis. Transforming the Appalachian Countryside: Railroads, Deforestation, and ... Books.google.com. p. 15. Archived from the original on 2018-01-05. Retrieved 2017-07-14. ^ Herrmann Schuricht. History of the German Element in Virginia. Books.google.com. p. 120. Archived from the original on 2016-12-04. Retrieved 2017-07-14. ^ Otis K. Rice; Stephen W. Brown. West Virginia: A History. Books.google.com. p. 9. Archived from the original on 2018-01-05. Retrieved 2017-07-14. ^ John Alexander Williams (1984-08-17). West Virginia: A History. Books.google.com. p. 9. Archived from the original on 2018-01-05. Retrieved 2017-07-14. ^ "Level III Ecoregions of West Virginia". U.S. Environmental Protection Agency. Archived from the original on 28 June 2014. Retrieved 29 September 2013. ^ "Bridgeport Historic Weather Averages in Ohio (43912)". Intellicast.com. Archived from the original on 2015-10-21. Retrieved 2017-07-14. ^ a b c d White & Allen, ed. (1891). "Mayors". Laws and Ordinances for the Government of the City of Wheeling, West Virginia. Printed by the West Virginia Printing Company. Archived from the original on 2018-01-05. ^ a b c d e f g h i j J.H. Newton; G.G. Nichols; A.G. Sprankle (1879). "Wheeling: Past and Present". History of the Pan-handle: Being Historical Collections of the Counties of Ohio, Brooke, Marshall and Hancock, West Virginia. Wheeling: J.A. Caldwell. Archived from the original on 2018-01-05. ^ a b John J. Coniff, ed. (1901). "Mayors of the City of Wheeling". Laws and Ordinances for the Government of the City of Wheeling, West Virginia. Archived from the original on 2018-01-05 – via Google Books. ^ a b History of the Upper Ohio Valley, with Family History and Biographical Sketches. Madison, Wisconsin: Brant & Fuller. 1890. Archived from the original on 2016-04-27. ^ a b c Thomas Condit Miller; Hu Maxwell (1913). West Virginia and Its People. New York: Lewis Historical Publishing Company. ^ a b "Wheeling History: Wheeling Hall of Fame". Ohio County Public Library. Archived from the original on July 3, 2016. Retrieved June 30, 2016. ^ "Office of the Mayor". City of Wheeling. Archived from the original on April 7, 2003. ^ "Office of the Mayor". City of Wheeling. Archived from the original on May 13, 2008. ^ "Mayor of Wheeling". City of Wheeling, West Virginia. Archived from the original on May 19, 2016. ^ "First Constitutional Convention of West Virginia". Archived from the original on 29 December 2013. Retrieved 17 February 2017. ^ "The Naming of West Virginia". Archived from the original on 14 November 2013. Retrieved 17 February 2017. ^ Newton, J. H., Nichols, G. G., & Sprankle, A. G. (1990). History of the Pan-handle: Being historical collections of the counties of Ohio, Brooke, Marshall and Hancock, West Virginia ... Bowie, MD: Heritage Books. ^ "Value of a Jesuit Education - Wheeling Jesuit University". Wju.edu. Archived from the original on 2007-08-08. Retrieved 2017-07-14. ^ "Wildcats Leaving Wheeling - WTRF-TV - WTRF.com". Web.archive.org. Archived from the original on 2011-10-23. Retrieved 2017-07-14. ^ "COM SUB 2 LINES". Legis.state.wv.us. Archived from the original on 2007-07-01. Retrieved 2017-07-14. ^ "INWheeling Home". Inwheelingmagazine.com. 2017-05-15. Archived from the original on 2017-05-21. Retrieved 2017-07-14. ^ "Weelunk - Do Something". Archived from the original on 24 November 2016. Retrieved 17 February 2017. ^ "Blog". Archived from the original on 17 October 2016. Retrieved 17 February 2017. ^ "News, Sports, Jobs". The Intelligencer. 1975-03-06. Archived from the original on 2016-01-13. Retrieved 2017-07-14. 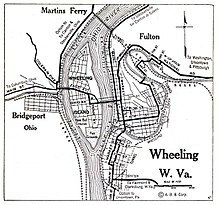 ^ "The City of Wheeling, West Virginia | About Wheeling > Getting Around". Wheelingwv.gov. Archived from the original on 2017-03-26. Retrieved 2017-07-14. ^ "Trolleys & Trains, Wheeling, WV - Wheeling Area Genealogical Society". Archived from the original on 2 June 2017. Retrieved 17 February 2017. ^ "Joseph M. Devine". National Governors Association. Archived from the original on 5 November 2012. Retrieved 13 September 2012. ^ "Edith Lake Wilkinson - Chronology". www.edithlakewilkinson.com. Archived from the original on 2016-11-04. "Ohio River: Wheeling". James' River Guide ... Mississippi Valley. Cincinnati: U.P. James. 1871. "Wheeling". Commercial Directory of the Western States. St. Louis: Richard Edwards. 1867. Wikimedia Commons has media related to Wheeling, West Virginia. Wikivoyage has a travel guide for Wheeling. Wikisource has the text of the 1911 Encyclopædia Britannica article Wheeling.